OMEGA Hi-Lok Installation Sockets with Set Screw Retainers are anti-FOD sockets and are manufactured to fit common square drives. OMEGA Hi-Lok Installation Sockets also feature a through-hole to allow the use of hex keys when they are needed for Hi-Lok®, Hi-Lite®, and Hi-Tigue® installations. As an anti-FOD measure, a set screw is provided to retain the sockets onto square drives. OMEGA Hi-Lok Installation Socket 9 piece set. OMEGA Hi-Lok socket with set screw retainer, 1/4'' double hex, 12-point opening, 1/4'' female square drive, 7/8'' OAL. OMEGA Hi-Lok socket with set screw retainer, 9/32'' hex opening, 1/4'' female square drive, 7/8'' OAL. Replaces Hi-Shear HLH102-281 and ATI ATSK3596-28. OMEGA Hi-Lok socket with set screw retainer, 5/16'' hex opening, 1/4'' female square drive, 7/8'' OAL. Replaces Hi-Shear HLH102-312 and ATI ATSK3596-31. OMEGA Hi-Lok socket with set screw retainer, 11/32'' hex opening, 1/4'' female square drive, 7/8'' OAL. Replaces Hi-Shear HLH102-343 and ATI ATSK3596-34. OMEGA Hi-Lok socket with set screw retainer, 3/8'' hex opening, 3/8'' female square drive, 7/8'' OAL. Replaces Hi-Shear HLH102-375 and ATI ATSK3596-37. OMEGA Hi-Lok socket with set screw retainer, 3/8'' hex opening, 1/4'' female square drive, 7/8'' OAL. Replaces Hi-Shear HLH102-375A and ATI ATSK3596-37. OMEGA Hi-Lok socket with set screw retainer, 7/16'' hex opening, 3/8'' female square drive, 7/8'' OAL. Replaces Hi-Shear HLH102-437. OMEGA Hi-Lok socket with set screw retainer, 7/16'' hex opening, 1/4'' female square drive, 7/8'' OAL. Replaces ATI ATSK3596-44. OMEGA Hi-Lok socket with set screw retainer, 1/2'' hex opening, 3/8'' female square drive, 1'' OAL. Replaces Hi-Shear HLH102-500. OMEGA Hi-Lok socket with set screw retainer, 9/16'' hex opening, 1/2'' female square drive, 1.25'' OAL. Replaces Hi-Shear HLH102-562. OMEGA Hi-Lok socket with set screw retainer, 11/16'' hex opening, 1/2'' female square drive, 1.25'' OAL. Replaces Hi-Shear HLH102-687. OMEGA Hi-Lok socket with set screw retainer, 1'' hex opening, 1/2'' female square drive, 1.5'' OAL. Replaces Hi-Shear HLH102-1000. The OMEGA ATHS687 11/16'' Hi-Lok Installation Socket, 1/2'' Square Drive is one of thousands of quality tooling products available from MRO Tools. Please browse Hi-Lok Sockets for tools similar to the OMEGA ATHS687 11/16'' Hi-Lok Installation Socket, 1/2'' Square Drive. 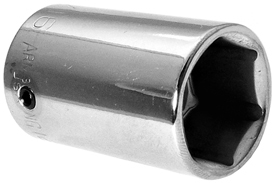 OMEGA ATHS687 11/16'' Hi-Lok Installation Socket, 1/2'' Square Drive description summary: OMEGA Hi-Lok socket with set screw retainer, 11/16'' hex opening, 1/2'' female square drive, 1.25'' OAL. Replaces Hi-Shear HLH102-687. Quantity discounts may be available for the OMEGA ATHS687 11/16'' Hi-Lok Installation Socket, 1/2'' Square Drive. Please contact MRO Tools for details.